The influence of Mozart, the king of comic opera, is easily apparent in this version of the Cinderella story by Rossini, a worthy successor to the crown. Rossini’s characters, for all the delight they bring, lack the psychological complexity of Mozart’s but in this colourful, storybook production this matters not one jot. Director Joan Font keeps the staging simple: a staircase, a huge fireplace that becomes a huge set of palatial doors. On this grey background, vibrant figures act out the familiar drama (there are a couple of diversions from the norm: the glass slipper is a bracelet, presumably because back in 1817 when the opera premiered, showing bare feet on stage would bring about the apocalypse; the fairy godmother is the Prince’s wise old tutor, disguised as a beggar…) Joan Guillen’s design dresses the characters in traditional storybook costumes, with exaggerations and some Fauvist colourings: the male chorus all sport blue wigs; the clownish make-up of the comic characters includes painted on blue beards… Font doesn’t miss a trick when it comes to the comedy, and if you spend too long peering up at the surtitles, you might not catch some bit of business that augments the situation, and supports the overall tone of Rossini’s effervescent score. Tara Erraught is sweetly dowdy – if that’s possible – in the title role, petting her only friends: an infestation of man-sized mice, who serve as stagehands and silent commentators on the proceedings. Fresh-faced tenor Matteo Macchioni is, well, Charming as the Prince, who for reasons of plot, spends most of the show in disguise as his own manservant, Dandini. Speaking of whom, Giorgio Caoduro, amid a host of amusing performances, proves the funniest of the lot as the manservant in disguise, camping it up as the Prince. Fabio Capitanucci all but chews the scenery as bombastic, ostensible villain-of-the-piece, the purple-wigged Don Magnifico. He and Caoduro excel at the patter, barking out rapid staccato almost to the brink of frenzy. Rossini, like Mozart before him, makes music sound funny. It’s a wonder to behold. Wojtech Gierlach brings gravitas to this bit of froth in the role of the wise and slightly wizardly Alidoro – a figure who owes more than a bit to Sarastro in The Magic Flute, while Aoife Miskelly and Heather Lowe have and give and lot of fun as the preening, posturing, bitchy sisters Clorinda and Tisbe, beneath towering pompadours of pink and bright yellow. The WNO male chorus are in splendid voice, whether singing on-stage or off, but it strikes me at curious that, at the ball, the Prince has only three female guests from whom to select his bride. The orchestra, under the flawless aegis of Tomas Hanus, deliver every note of Rossini’s frantic music to perfection. Sometimes it’s so fast it’s as though the characters are in a hurry as they try to express the thoughts and emotions that are pouring out of them like champagne from a newly-popped bottle. A delight from start to finish, this is a breath-taking feast for the ears with plenty of visual humour to keep the funny-bone tickled. For me, it serves as a curtain-raiser for the impending pantomime season, as yet again WNO provide world-class entertainment with a production that would make the perfect introduction to the genre for anyone. It would be a cin-der miss it. A.A. Milne’s stage adaptation of Kenneth Grahame’s beloved novel is a classic in its own right, and its brought to charming life here by director Nicky Cox and a talented cast. The playful staging (umbrellas for wagon wheels, stepladders for trees) sits well in the studio space, while the energised performances of the actors makes the action irresistible. Natalie Danks-Smith is a likeable Mole, a blinking innocent who finds there’s a world of adventure beyond her front door. Dominic Skinner’s affable, dapper Ratty represents what is decent in all of us. Badger (Shirley Allwork) is the voice of experience and authority – the characters each represent an aspect of human nature, it seems. Toad himself is an irrepressible hedonist, selfishly sweeping everyone else along with his whims and fads, embroiling them in the problems he creates. Toad is also a supreme manipulator, caring only for his own interests – he is the attractive but negative side of us, all ego and no conscience. He thinks the law of the land does not apply to him – much like certain members of the ruling class today! As Toad, David Mears is magnificent. Repellent and attractive at once, his antics are enjoyable if reprehensible, and Mears’s performance is a masterclass in comic acting. No detail is overlooked. Every twitch of an eyelid, every roll of the eyes is calculated to perfection. Toad almost swamps the stage with his personality but Allwork’s Badger provides a well-tuned counterpoint, and an equally rounded if contrasting characterisation. It is a treat to see these two working together. There is sterling support from Charlotte Froud as a sardonic horse, Philip Hickson as a blustering judge, David Southeard as an affronted policeman, but all players work with commitment and focus, be they providing the walls of a secret tunnel or nattering away as members of the jury. Pamela Hickson gives a delightful cameo as an exuberant washerwoman. Songs are performed a capella – the ‘Down With Toad’ by Chief Weasel and his confederates is especially effective. It all adds up to an enjoyable evening (my political reservations aside!) excellently presented and reinforcing the Bear Pit’s reputation for the high quality of its productions. Hats off to the Grand! Since it first opened its doors in 1894, the Grand Theatre has been the best reason to visit Wolverhampton. Now, 122 years later, the theatre is entering the next phase of its evolution with a massive and thorough refurbishment of the bars and front of house areas. The transformation is remarkable. There is a new bar in the foyer, a long curving counter with mood under-lighting. This bar will be open from 11am Monday to Saturday, rather than only during show times. The former stalls bar is now the Encore Lounge – the most drastic refit of the lot, including a new performance space – as I nose around, a jazz trio tinkles away, their music broadcast through the building by the newly installed sound system. Here, more space is given over to seating. Booths have been installed and – a lovely touch – bowler and top hats form the lampshades over the tables. The Dress Circle also has a new bar, Arthur’s of the Grand – so named because of sponsorship from cutlery manufacturers Arthur Price. New booths give the loggia a more intimate feel. It all looks rather splendid, I have to say. The décor is classy and elegant without being imposing. Further up, on the Grand Circle level, the ‘bar that time forgot’ has not escaped the designers’ attention. It too is now invitingly swish. There is also The Spotlight Lounge, a function room and boardroom available for hire. Bars and hospitality are important, to be sure, but the main business of the theatre remains unchanged. The plush auditorium has not been neglected. All 1200 seats have been replaced with new, ‘soft-closing’ seats for noise reduction and, I can testify, they are very comfortable, soft with firm back support and improved leg room, it seems. I decide I might move in, Phantom of the Opera style. Just don’t tell the management. The casual opulence of the refit has rejuvenated this beautiful old building, giving it a lift and making it the place to be. I’m already looking forward to a return visit. You can check out details of the Grand’s new season here, and then go and check out the splendid upgrade for yourself. This photo in no way does justice to the Grand’s lovely refurb – I was too preoccupied with sampling the hospitality to take pictures! Off our screens for too long, Wincey takes us through her life story, revealing that the period of fame she enjoyed is not the only talk-worthy feather in her cap. The evening is relaxed. Wincey is clearly at ease as producer Matthew Jones asks questions and prompts anecdotes, in a casual, we’re-all-friends-here, manner. When there is a problem with her mic crackling, Wincey is unfazed. Years of live TV broadcasts have honed presenting skills that are still very much in evidence. We hear about her early life, her strict adoptive mother, the trouble she got into at school. Wincey tells us funny stories in an offhand way, with the kind of deadpan Northern camp that would make her ideal for Alan Bennett. Stories are illustrated by projections of photographs from Wincey’s personal collection, adding impact to her recollections. There are some touching moments of how she used professional fame to call in favours and make some dying kids happy and, from her personal life, the decline into dementia of a beloved aunt. There are also examples of her poetry, including a recording from BBC Radio 4 of a powerful piece she wrote about learning the name of her birth mother. It’s not so much a confessional as a “this was me then and this is me now” kind of thing. Wincey doesn’t dish the dirt on other celebs (although I’m sure she could) – this is a much classier affair. You cannot fail to enjoy her company. 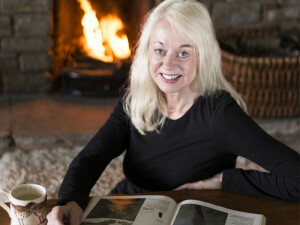 She tells exciting tales of turtle egg conservation which involve being shot at – Wincey gave up telly to pursue her lifelong passion for wildlife protection and travelled the world in far from glamorous conditions. She had the time of her life. What made Wincey popular on the small screen is what continues to make her so likeable today: she is down-to-earth, honest and funny, with a generosity of spirit that draws you in and makes you feel at home. A thoroughly charming and engaging couple of hours – including a surprise a capella rendition of Summertime and a generous helping of laughter, An Audience With Wincey Willis demonstrates audiences still have a great deal to enjoy from this popular figure of yesteryear.